Light in Motion Recipient 2018. 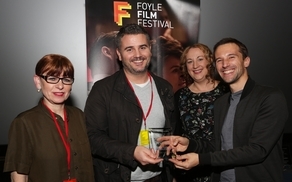 Foyle Film Festival has launched its 2019 Light In Motion (LIM) competition, which is open to filmmakers and animators across the world. Based in Derry, the festival competition will remain open for entries until September 23, 2019. The category winners will be announced at the closing evening Light in Motion Awards Ceremony on Sunday 24 November 2019. Previous festival winners and competitors who have proceeded to win the Oscar® include: Terry George for ‘The Shore ‘(2012), Martin McDonagh for ‘Six Shooter’ (2006), Andrea Arnold for ‘Wasp’ (2004), Adam Elliot for ‘Harvie Krumpet’ (2003), and Eric Armstrong for ‘Chubbchubbs’ (2002). The success continues with 2018 Oscar® nominations for LIM Award finalist ‘The Silent Child’ directed by Chris Overton and 2018 BAFTA award in Short Animation for LIM Award finalist ‘Poles Apart’ directed by Paloma Baeza and Ser En Low. Funded by the Department for Communities through Northern Ireland Screen, by Derry City and Strabane District Council and Tourism NI, Foyle Film Festival delivers a comprehensive programme of documentaries, short films, and feature films from all over the world.